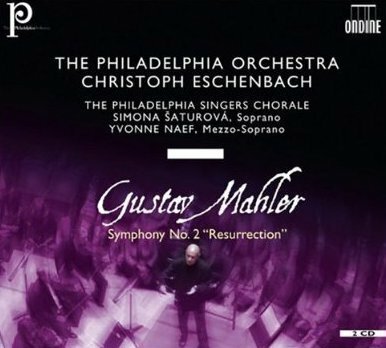 Hot on the heels of Gergiev's LSO Live 'Resurrection' comes this release on Ondine from Christoph Eschenbach and the Philadelphia Orchestra, similarly taped live. Audiophiles will be disappointed that unlike the first instalment of their cycle, a very well received sixth symphony, or Gergiev's, this recording of the second is on standard CD rather than SACD. On two discs, without a coupling, it enters one of the most competitive fields in the catalogue. Contrast with Gergiev's hard-pushed account is instructive and it's difficult to imagine a greater contrast. For here, although we roar into the first movement with reassuring power, Eschenbach's reading often sounds a little cautious. Mahler's score, admittedly, is full of markings which Eschenbach mainly follows – particularly, it would seem, those entreaties not to rush – but for me, the results miss some of the drama, the tension and, frankly, the excitement that this music should evoke. Some of the long-breathed build-ups are less than convincingly handled and, for example, when Eschenbach slowly grinds out the crushing, dissonant chords at 15'30 (marked molto pesante) the result sounds unnatural, seeming overly rhetorical in the context of so much that's understated. The lyrical episodes are often beautifully handled – with some fine playing from the Philadelphians – but I was left wishing for the movement as a whole to be more visceral, with greater forward momentum. The central movements are somewhat more successful. Eschenbach's tendency towards relaxed tempi causes few problems in the Andante which is affectionately turned, with an appealing lilt; Mahler's instructions not to hurry – 'Nicht eilen!' – have again been taken to heart. I would have liked more of an acerbic edge to the Scherzo which only occasionally hints at the biting satire of the Wunderhorn song from which it's taken. The woodwind, in particular, do little to underline the humour Mahler asks for; a lot of it sounds rather too comfortable, although the trumpets do snarl magnificently. 'Urlicht', on the other hand, comes across very well, even if Mezzo Yvonne Naef is not ideally steady. And so on to the massive Finale. And in Eschenbach's reading it really is massive, coming it at over 37 minutes long. The conductor manages to maintain a structural unity over this vast span that is very impressive and where Gergiev seemed keen to get to the thrilling apotheosis by the quickest route – his reading comes in at a 31'44 – there's no doubt that when we get to the end here, we've earned it. On the way, there's an awful lot to admire: the breathtaking way the musical landscape opens up after the mysterious brass chorale, with the horns and trumpets playing magnificently; the beautiful solo work from the principal trombone, in particular, that makes one look forward to their recording of the third; the still, almost imperceptibly hushed entry of the chorus. Yet there's still some doubt as to whether or not Eschenbach succeeds in balancing this structural overview with the demands of sustaining interest and momentum on a more local level. Admittedly he seems keener to whip up the drama here than in the opening Allegro maestoso but there are also times when we have something cerebral when it should be visceral and therefore, paradoxically, the episodic nature of the movement is more apparent. In the build up from around 12'30, for example, the brass interjections sounds almost disinterested, whereas they should be part of an inexorable goal-oriented build-up. When the final chorus does appear, the effect is magical as ever (despite The Philadelphia Singers Chorale being placed a little far back in the balance), but the journey to that point often just feels rather too leisurely. Eschenbach is a serious Mahlerian who is to be admired for looking beyond the surface brilliance of this work. However, for all the integrity of this reading, it strikes me as short on drama.